Golden Road Brewing brings you the Golden Road Beerland Dream Bar Sweepstakes Giveaway at Goldenroad.la/beerlandsweeps where they are going to giveaway “Home Bar Upgrade” to 3 lucky winners that includes kegerator, back bar piece with cabinetry, bar stools, 42”TV and two (2) cases of Golden Road Brewing glassware and more. 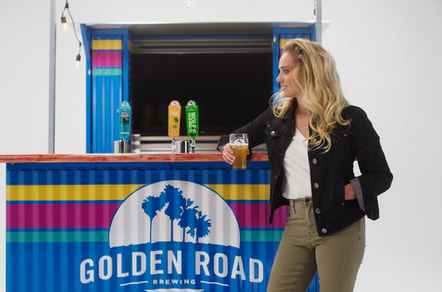 How To Enter The Sweepstakes At Goldenroad.la/beerlandsweeps? Visit this link:Goldenroad.la/beerlandsweeps to go to the sweepstakes page. (“3 Grand Prizes“) Home Bar Upgrade to 3 lucky winners that includes kegerator, back bar piece with cabinetry, bar stools, 42”TV and two (2) cases of Golden Road Brewing glassware and The first twenty-thousand (20,000) participants who submit a valid entry during the Sweepstakes Period will receive one (1) Golden Road Brewing keychain valued at $2.00. Who Can Enter: This sweepstakes is open only to legal residents of the United States who are twenty one (21) years of age or older at the time they enter the sweepstakes. When To Enter: The Golden Road Beerland Dream Bar Sweepstakes entry begins at 12:00:00 a.m. Central Daylight Time (“CDT”) on May18, 2018 and ends at 11:59:59 p.m. CDT on August 31, 2018. Sponsor: This Sweepstakes is sponsored by Golden Road Brewing, Los Angeles, CA.